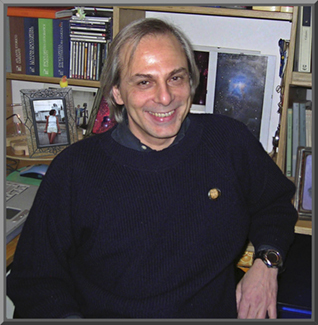 Born in Turin in 1957, my childhood was marked by an irresistible interest in astronomy since, when watching at the starry sky from the balcony of my home through a small achromatic refractor, I seemed to possess a magic instrument. To tell the truth I wonder what I could have seen under the already polluted sky of Milan. Nevertheless my heroic refractor gave life to a passion I share even today. My bent for the starry sky and everything concerned - readings about astronomy, astrophysics and so on - helped me seeing beyond the limits of the inflexible laws of optics. For many years music has been both my passion and profession. So much so that I received a Music degree in flute in 1982 at the Conservatorio 'Giuseppe Verdi' in Milan. At present - I don't know exactly the why - I've changed my professional carrer to become a TV writer. However, I'm still enjoying my two loves: the harmony of heavenly spheres is the deepest satisfaction to me.